Benjamin Tiven is an artist and writer living in New York. Brian Larkin is an associate professor of anthropology at Barnard College. He is the author of Signal and Noise: Media Infrastructure and Urban Culture in Nigeria (2008) and, with Lila Abu-Lughod and Faye Ginsburg, co-editor of Media Worlds: Anthropology on New Terrain (2000). Larkin’s research focuses on the ethnography and history of media in Nigeria. He has published widely on issues of globalization, piracy and intellectual property, and Nigerian films (Nollywood) in such journals as Public Culture, Africa, Social Text, and Cahiers d’Études africaines. Larkin is currently working on a book, provisionally titled Secular Machines: Media and the Materiality of Islamic Revival, which analyzes the role of media in the rise of new Islamic movements in Nigeria. Tavia Nyong’o is an associate professor of performance studies at New York University. His first book, The Amalgamation Waltz: Race, Performance, and the Ruses of Memory (2009), won the Errol Hill Award for best book in African American theatre and performance studies. Nyong’o has published articles on punk, disco, viral media, the African diaspora, film, and performance art in venues such as Radical History Review, Criticism, TDR: The Journal of Performance Studies, Women & Performance: A Journal of Feminist Theory, Women Studies Quarterly, The Nation, and n+1. He is co-editor of the journal Social Text. “Everyday Static Transmissions” was published as part of Triple Canopy’s Internet as Material project area, which receives support from the Andy Warhol Foundation for the Visual Arts, the Brown Foundation, Inc., of Houston, the Foundation for Contemporary Arts, the Lambent Foundation Fund of Tides Foundation, the National Endowment for the Arts, the New York City Department of Cultural Affairs in partnership with the City Council, and the New York State Council on the Arts. What did the president do today? A conversation about boring images, state power, and the films produced by regimes from Kenya to Nigeria, in the 1970s and today, now residing in threadbare archives and on YouTube. In September 2012, the small media network for whom I had been working in Nairobi arranged for me to visit the video archives of the Kenya Broadcasting Corporation. KBC was the national television network from 1964 until ’89, when it was partly privatized; during this time it was known as Voice of Kenya. The station's archive contains footage dating as far back as the late 1960s. KBC’s collected video and film materials are historic, but are not catalogued according to any official mandate for accuracy or completeness, and the collection is not open to the public. Much of the holdings are deteriorating, or are in outmoded media formats that the station no longer has the equipment to play. Over the years, various other governmental agencies—such as the National Archives, the department of film services, and the public-relations branch of the president’s office—have permanently withdrawn selections of footage to satisfy any number of ulterior agendas. Despite the technical lapses and omissions, KBC’s archive represents an original effort by a state to create an image of itself and to legitimate its power through control of mass visual media. 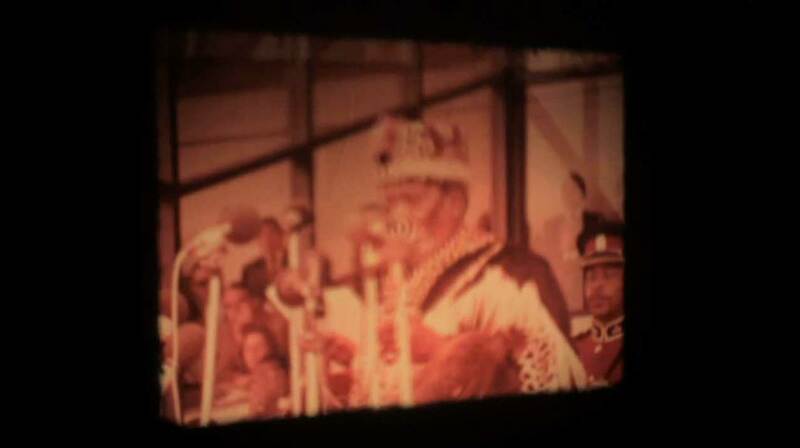 The film project that emerged from my visit, A Third Version of the Imaginary (2012), turns on a fleeting image of Kenya’s founding president, Jomo Kenyatta, giving a speech at the independence parade of 1973, the country’s ten-year anniversary. The autumn of 2012 was also the height of a political campaign season from which Kenyatta’s son, Uhuru, ultimately emerged as the nation’s fourth president. The following conversation occurred in person and over email between November 2013 and February 2014. We began by looking at images of the elder Kenyatta at the 1973 parade. 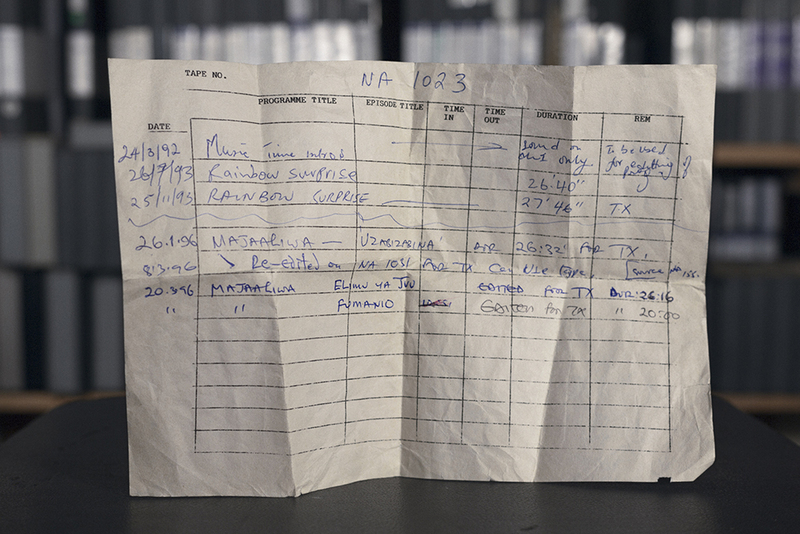 Benjamin Tiven, Image Index 1 (Paperwork Listing All Shows Hosted on a Given Reel of Tape, in the Order They Were Recorded and Then Rerecorded), KBC Archives, Nairobi, 2013, inkjet print, 16" × 24". 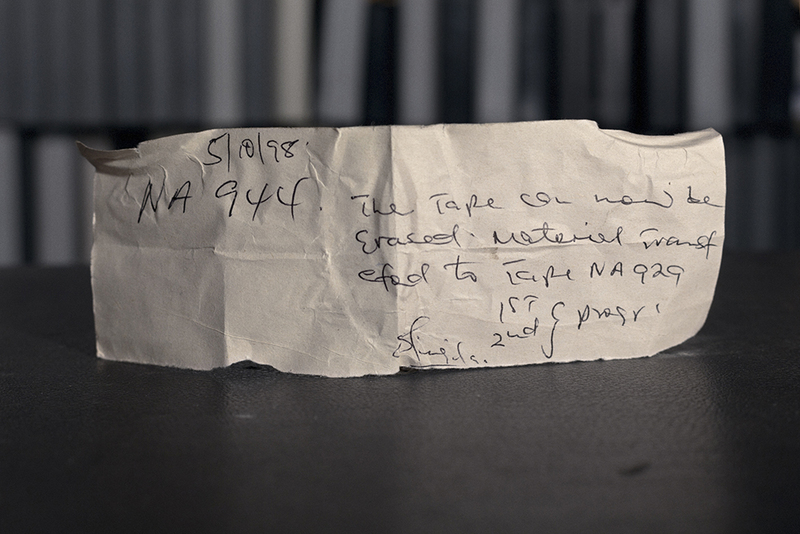 Benjamin Tiven, Image Index 2 (Paperwork Listing All Shows Hosted on a Given Reel of Tape, in the Order They Were Recorded and Then Rerecorded), KBC Archives, Nairobi, 2013, inkjet print, 16" × 24". 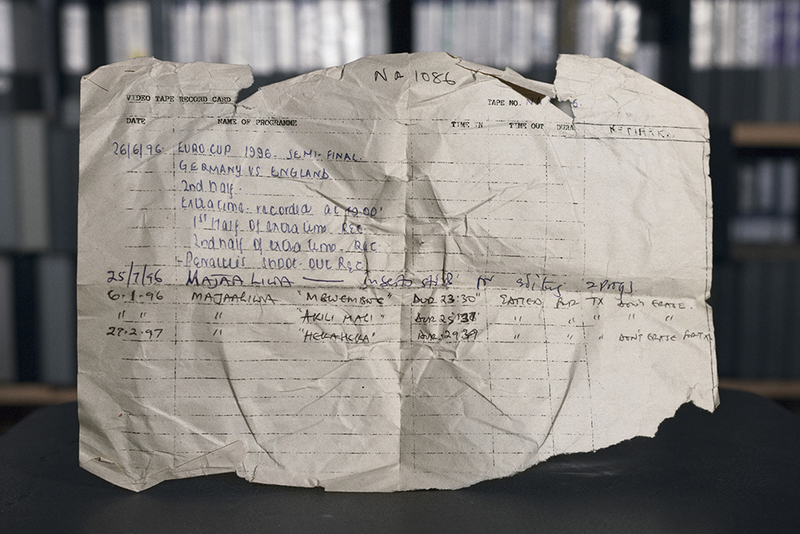 Benjamin Tiven, Image Index 3 (Paperwork Listing All Shows Hosted on a Given Reel of Tape, in the Order They Were Recorded and Then Rerecorded), KBC Archives, Nairobi, 2013, inkjet print, 16" × 24". 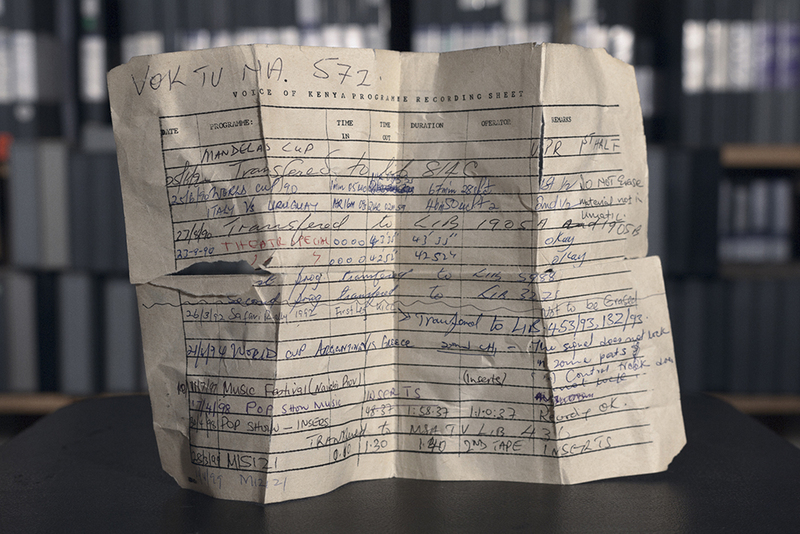 Benjamin Tiven, Image Index 4 (Paperwork Listing All Shows Hosted on a Given Reel of Tape, in the Order They Were Recorded and Then Rerecorded), KBC Archives, Nairobi, 2013, inkjet print, 16" × 24". 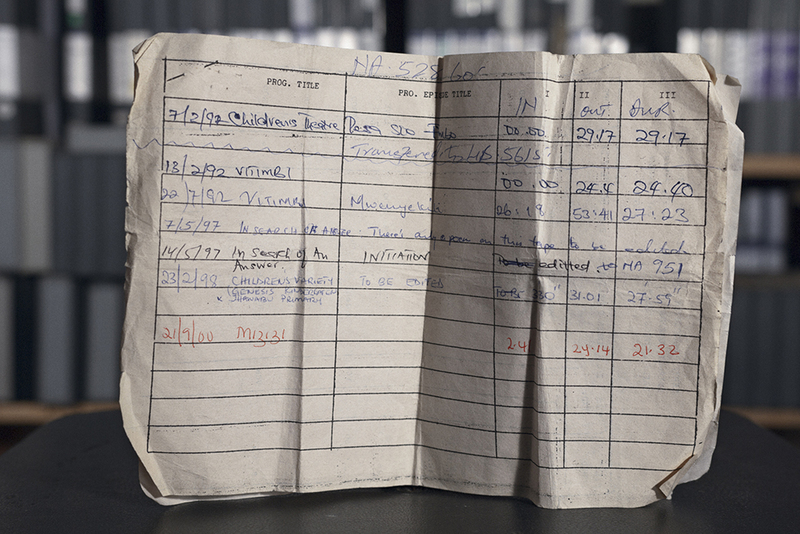 Benjamin Tiven, Image Index 5 (Paperwork Listing All Shows Hosted on a Given Reel of Tape, in the Order They Were Recorded and Then Recorded Over), KBC Archives, Nairobi, 2013, inkjet print, 16" × 24". BRIAN LARKIN These 16-mm film stills are a good reminder that the performance of power, intrinsic to the presidency, is linked to the form of the image. The stills are intensely theatrical and iconic, with staged backgrounds and prominent, isolated foregrounds. These kinds of KBC films devalue the three-dimensional, dynamic nature of the medium, instead presenting repetitive, flattened tableaus: often a single person, alone at a podium or wading through a crowd. It’s not that much different from a photographic image. And they are made to look that way, because, while they take advantage of the distribution system of television and sometimes also cinema, they’re not intended to animate a narrative or evolve a character. The films are designed to establish and present authority in concrete, immediate terms. Images such as these are meant to evoke the power of the state, but often—due to power cuts, mis-synched sound, clumsy edits, or even just an awkward shot—but instead end up revealing systemic flaws or bureaucratic ineptitude. 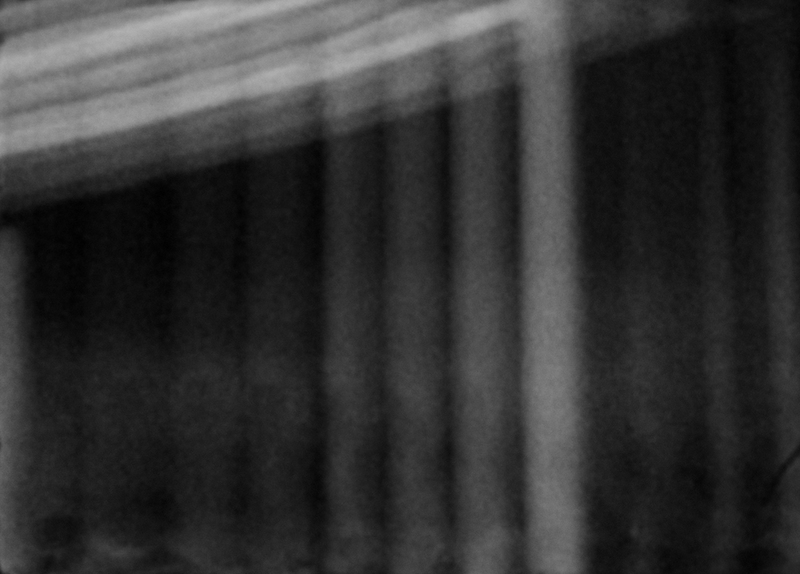 One shot in “A Third Version of the Imaginary” depicts a projector working to play a reel, but the machine sputters, and the moving image is never fully formed. To me, this shot raises the question: What happens when an image designed to present state power fails? What wider conditions do technical breakdown imply, beyond that single instance of failure? Often, breakdown allows for new forms of presence. BENJAMIN TIVEN What do you mean by presence? In Signal and Noise, you write that the collapse of technical infrastructures tends to produce two outcomes: The failure of government to deliver the service is revealed, and these dysfunctional, or partly functional, systems give rise to new cultural forms. LARKIN Breakdown shouldn’t be seen as the absence of something, but rather as the groundwork for something else coming into existence. For instance, in Nigeria, the breakdown of the electrical grid has produced new social norms around ubiquitous electric generators. And as the UCLA anthropologist Chris Waterman has written, in Jùjú music, the distortion of low-grade speakers became such a part of the sound that fancier speakers would have to be roughed up a bit to sound right. Breakdown does have its own aesthetics—by which I mean the whole operation of form upon the sensorium, and the experience that a given form produces in its receiver. TIVEN You write about infrastructures as both technical and conceptual objects. How would you apply that definition to state television? LARKIN Let me extrapolate from my research in Nigeria, where cinema, radio, and television were set up during the colonial era to carry out specific ideological work. They were never neutral vessels for entertainment, but were always involved in an explicit pedagogical project: the formation of colonial subjects and later, in the nationalist era, modern subjects. Many early colonial newsreels depict politicians opening a new electric plant, road, or bridge; they show infrastructure as a dimension of modernization. Later, television became the infrastructure tasked with representing other infrastructures. But whether under a colonialist or nationalist government, recording and disseminating images of infrastructure has always been a way to legitimize power. In the early nationalist period, images of leaders opening new factories were evidence of a hopeful and ambitious new state. Decades later, after years of endemic corruption, the same images were still in use, but had become signs of the state’s failure. TAVIA NYONG’O Growing up in Nairobi, I learned very early that broadcast media was not only a sign of power, but helped to establish its authority. My earliest memory of KBC is from 1982, when the station was still named Voice of Kenya, during the failed Air Force coup against President Daniel arap Moi. The first thing the soldiers did was seize VoK and announce that they had taken control of the country. Later that same day, with the coup put down, the Moi regime came on the same airwaves to confirm that it, in fact, remained in charge. Even as a child, this gave me the strong impression of broadcasting as a synecdoche for governance. But as a means of disseminating ideology or some kind of national fantasy, VoK was actually quite limited. The programming was pretty dull: I always really liked the imported American or British sitcoms, but the rest were bland talk shows, folkloric dance and music, and government propaganda—often, indeed, in the form of documentaries showcasing new national infrastructure, the cinema typology that Brian calls “developmental realism.” All of the VoK news transmissions from the 1980s and early ’90s began with a daily film diary of the president, and started, ritualistically, with, “His excellency President Daniel Toroitich arap Moi today did . . . ” Nevertheless, everyone watched VoK because it was the only channel on the air. TIVEN Could we examine that dullness more closely? Most of what I saw at the KBC archives could indeed be described as dull: They were mostly direct transcriptions of ceremonies or events. Is the dullness of Kenyan state television just an aesthetic artifact of how its particular management went about producing, as you said, modern subjects? LARKIN Well, state television is run by civil servants who operate by pleasing superiors. I don’t think individuals intentionally make boring programs. But in practice, and especially in the postindependence years, television became a mechanism to convey rule, which meant a proliferation of repetitive, endless images of soldiers in training, of bureaucratic meetings, of the pouring of concrete—the putative evidence of the government actually doing things. Dullness is, in some sense, an incidental property of this image-form. But we could ask: If television images are supposed to connote state authority and yet are incredibly boring, have they failed? Or does the fact that these images are so boring and yet still dominate the landscape suggest that dullness is a de facto expression of power? Because, it’s actually not uncommon for rule to operate through boredom. KBC news feature on the launch of a GoTV digital signal transmitter in Limuru, Kenya, originally aired on January 12, 2013. TIVEN But these television broadcasts, however dull, must have conveyed some visual charge. In Kenya, a succession of three presidents maintained power for four decades. Presumably, there is a deep connection between this stability and the charismatic performance of power. NYONG’O Each Kenyan president had his own signature prop. Kenyatta had his regal robes and African nationalist colors, and Moi was never pictured without his short cane. Kenyatta is regarded as the father of the nation: Born Kamau wa Ngengi, he later renamed himself after his kinyata, a type of traditional beaded belt, in a gesture that encoded national charisma. Moi, on the other hand, was an unintended president who shrewdly crafted his path to power after Kenyatta’s death. He always presented himself as the humble, self-abnegating successor, though, because he lacked Kenyatta’s ethnic base. Moi even adopted the political motto “Nyayo,” which means “footsteps”—as in, following after Kenyatta’s. But both of these presidents had an official image regime beyond the television specials and newsreels we’ve been discussing. Framed portrait photographs were prominently displayed in every small business or office; political posters often lined city roads and public plazas; and an image of the head of state was reliably found on the currency. When the president changed, the money changed. It was significant when, in 2002, as Kenya returned to multiparty democracy, the new president, Mwai Kibaki, made a point of restoring Kenyatta’s face to the currency rather than using his own. That really began the process of archiving the presidency. The point of these proliferating images was not to fascinate citizens, or even to be ideologically convincing, but to attain ubiquity. 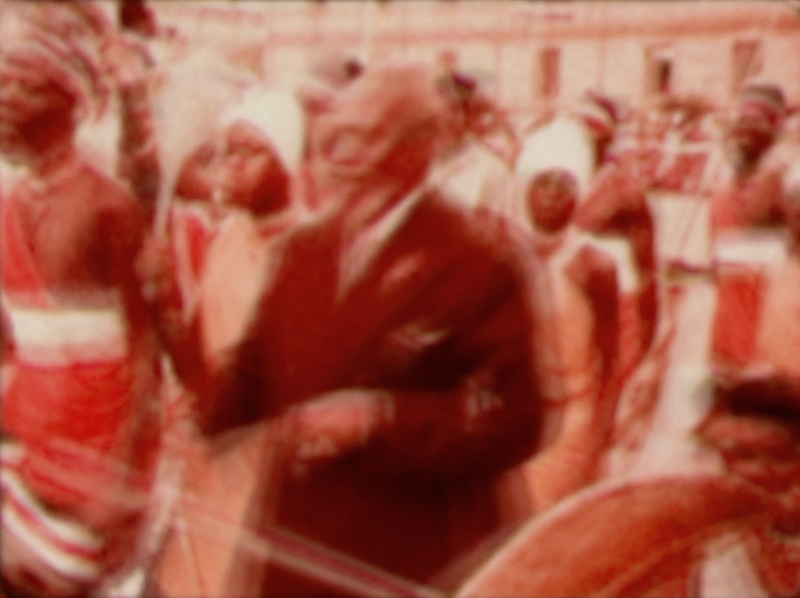 Benjamin Tiven, Jomo Kenyatta, Independence Day Parade, December 12, 1973, 2013, inkjet print 16" × 21". Benjamin Tiven, Daniel arap Moi at a Public Presentation, Unknown Date, 2013, inkjet print 16" × 21". 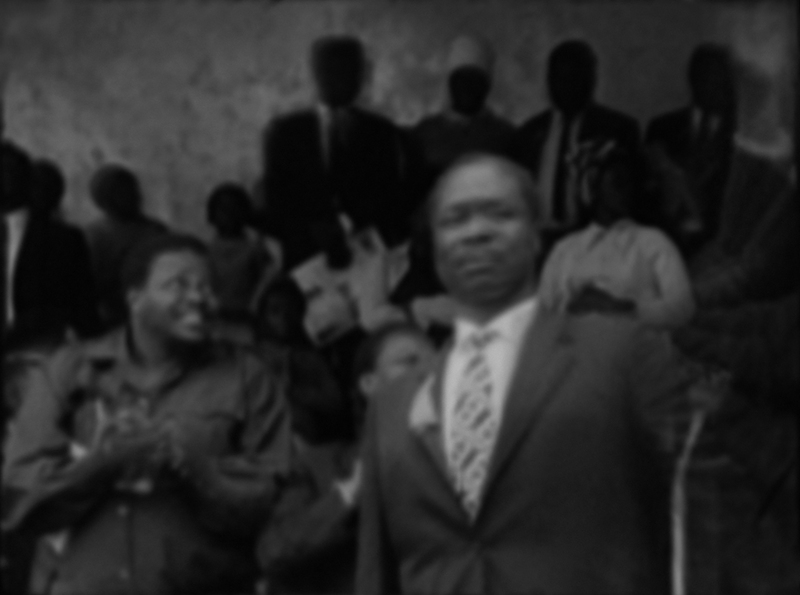 Benjamin Tiven, Daniel arap Moi at a Public Presentation, Unknown Date, 2013, inkjet print 20" × 25". 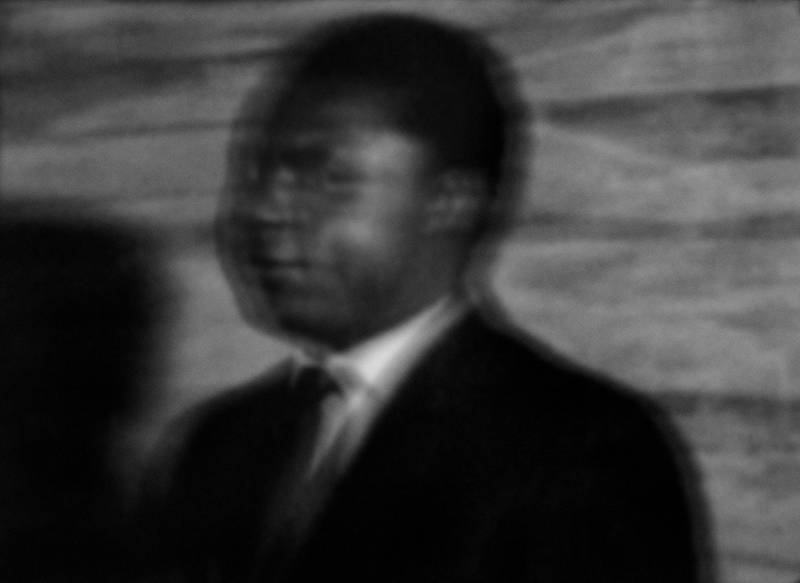 Benjamin Tiven, Tom Mboya, Planning and Development Minister, Addressing the United Nations Economic Commission for Africa, 1966, 2013, inkjet print 14" × 20". For much of President Hafiz al-Asad’s rule (1970–2000) his image was omnipresent. In newspapers, on television, and during orchestrated spectacles, Asad was praised as the “father,” the “gallant knight,” even the country’s “premier pharmacist.” . . . By inundating daily life with instructive symbolism, the regime exercised a subtle yet effective form of power. The cult worked to enforce obedience, induce complicity, isolate Syrians from one another, and set guidelines for public speech and behavior. Even when citizens kept their ironical distance, even [when] they demonstrate[ed] that they [did] not take what they were doing seriously, they were still doing it. They were complying. TIVEN This quest for ubiquity is served quite well by the static, almost photographic shooting style that we were discussing earlier. Particularly during the Moi era, I imagine that VoK television provided a kind of serial narrative that never actually advanced, and always starred the president. Is it possible to speculate, using these archival materials, on how this kind of cinema might have conditioned spectators? LARKIN All film cultivates some kind of subjectivity in the viewer, and I would argue that Kenyan state television likely inculcated people, in a kind of political training. This is quite different from the way cinema (and later television) functioned, in America, to instruct subjects in commodity consumption and participation in the industrial labor force, as scholars like Jonathan Crary and Jonathan Beller have asserted. But to fully diagnose an operative theory of the image in these materials, we would have to know whether the original political mandate was actually to make specific kinds of images, or simply to practice recording them. The practice of recording is similar to the guy who carries an umbrella over a royal figure: The mere production of television footage in public might itself have been a sufficient emblem of power. 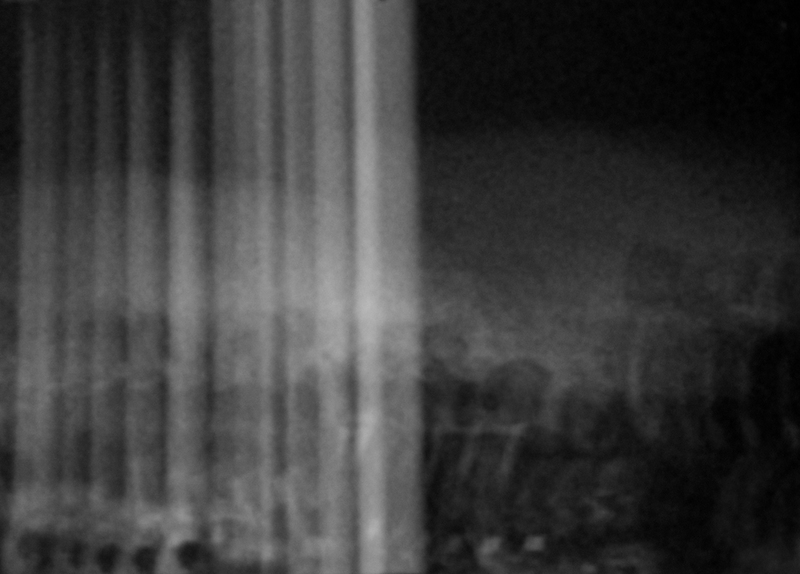 Benjamin Tiven, A Third Version of the Imaginary, 2012, digital video, 12 minutes. TIVEN The 1973 independence-parade newsreel, too damaged to thread through the projector, was filmed on color stock, even though VoK couldn’t broadcast a color television signal until 1978. Maybe this implies an institutional position on the future legibility of the image? Or could it have been sheerly practical? After all, this kind of special event footage would have been shown in movie theaters, too, as a short before a popular feature. NYONG’O I remember seeing some of those news films, actually. My mother wouldn’t allow television in our household, but we did go to the movies, which all began with a state newsreel. It actually never occurred to me that KBC might have an archive, and I am fascinated by its existence. Had I known there was one, I suppose I would have thought it’d be a state secret. Of course, KBC’s failure to maintain these physical materials, or to effectively catalogue them and make them accessible, does make them into a kind of state secret. The failure reiterates that controlling the record, as much as the original transmission, is a technique of power. We haven’t yet discussed these other 16-mm film stills, which persistently index people or events that have since been obscured or suppressed. For example, this image of Tom Mboya, an economic minister whose assassination was never fully resolved despite the conviction of his murderer. Because film is relatively hard to overwrite, compared to video or digital media; there’s a link between the materiality of this archive and the recovery of political legacies. I am particularly interested in how such lost potentialities are historically narrated, since I lived in Kenya during the period of transition to multiparty democracy, such as it is. However, a focus on this era might now be irrelevant, or even politically counterproductive, for people in Kenya. TIVEN How do you think the state’s official strategies for making and disseminating images will change under Uhuru? Will he strive to reestablish historically typical levels of ubiquity? Will official government insignia find new (presumably digital) spaces in which to operate? From what I saw at KBC, at any rate, television is certainly no longer the state’s primary vehicle for self-presentation. KBC broadcast of the inauguration of Uhuru Kenyatta, April 9, 2013. NYONG’O Uhuru is very au courant: he was educated at Amherst and speaks with the fluency of the dot-com era. His indictment at the Hague for crimes against humanity, and his tactical deployment of anticolonial, anti-Western rhetoric, have made him unpopular with the Obama administration, but I imagine his presidency will take shape in the neoliberal mold. His image is shaped and managed by the British PR firm BTP Advisors, who worked on both his campaign and his response to the ICC investigation. I really think of him more as the political legatee of Moi than of his father. Moi sponsored Uhuru’s first run for the presidency, and also mentored his one-time nemesis, William Ruto, who is now his vice president. Obviously the fact that Uhuru is Jomo Kenyatta’s son is relevant, but it is perhaps this other, more calculating political legacy that animates him. I agree that monopolizing television broadcasting is no longer of chief concern to the Kenyan state. In part, that’s because television in Kenya, after twenty years of privatization, is today crowded with “choices.” (In Kenya, such privatization has been narrated as part of “democratization”; but market freedoms have, in time, subsumed democratic ones.) Still, television is not something that the state, or capital, is willing to surrender entirely, despite the explosion of text messaging and the so-called mobile space. During elections, or a crisis like the Westgate terrorist attack, the state tends to reassert control of communication. Certainly, even in such a diffuse media landscape, Uhuru will find a visual regime appropriate to his multiparty-democracy security state. TIVEN One reason I initially tried to get access to the KBC archive was that I’d been told it was being digitized. In fact, it is not. But if it were, and all materials were catalogued, the archive could generate a lot of revenue, as it has a lock on visual records of the first four decades of the country. Digitization could also expand KBC beyond the realm of television and keep the network relevant. LARKIN Yes, but the government would need a clear political imperative to make this material available to the public, since doing so could be extremely expensive and, realistically, might garner only a small amount of revenue. And, of course, granting access to the material opens it to interpretation. The state would need to have a theory of how the archive advances the project of national patrimony, or a sense of its singular importance. In the case of Kenya and Nigeria, I don’t think anyone makes that argument. NYONG’O This is also a question of legacy platforms and fixed capital. KBC is an old broadcaster competing with digital media companies, most of which have larger pools of resources. Nation TV, for example, is owned by the Aga Khan media group. While KBC has access—in theory, at least—to the massive resources of the state, it also has a burdensome physical plant and a clunky, holdover mission statement. Kenyans are much more excited about social media and mobile phones; and given the significant size of the rural population, radio remains much closer to everyday life than television. KBC is not going to be shut down, but there is no longer an ideological imperative to advance the network. In Kenya, 50—70 percent of the national budget vanishes because of graft and corruption. At a time when the political choices are between, let’s say, buttressing national security and saving old 16-mm film recordings, how likely is it that the necessary equipment for the latter is going to suddenly appear?